iPhone X fundamentally changes many aspects of what has been the most incredibly popular and lucrative franchise in consumer technology. That could be seen as a wildly risky move: "if it ain't broke, don't fix it!" But in the fast-moving world of technology innovators, the prime directive is to "move fast and break things" to deliver something even better. Apple prefers to think of its new phone as finally achieving the ambitious goal of making the face of iPhone an entirely digital, 3D Touch display that blurs the line between the device hardware and software running on it. That's a straightforward extension of the goals Steve Jobs outlined for the original iPhone a decade ago: a large bitmapped display — replacing the status quo of mechanical buttons — on a mobile device streamlined to be as simple as an iPod, powerful enough to deliver a "breakthrough internet" experience and secured from the Flash world of malware, invasive ads and privacy robbing spyware. The futuristic newness of iPhone X involves both pros and cons, much like the original iPhone ten years ago. The main difference is that in 2007, Jobs' leadership of Apple was only ten years old. Today's Apple has another decade of modern experience under its belt, informed by a decade of highly regarded, pragmatic, commercially successful work in mobile hardware engineering, custom silicon and advanced iOS software and platform development. 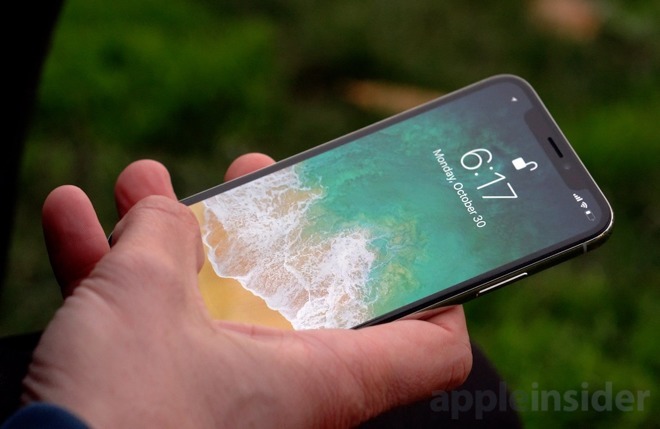 iPhone X introduces the Super Retina Display, a lusciously vibrant new OLED display technology with a higher pixel density, a taller screen ratio and a larger, rectangular outline that looks like a glossy photo, not a bitmapped display. It ditches the Home button, replacing the design and functionality of Touch ID while rethinking all of the gestures related to Control Center, notifications, app switching, device wake and unlocking, and authentication for Apple Pay, App Store purchases and within apps. 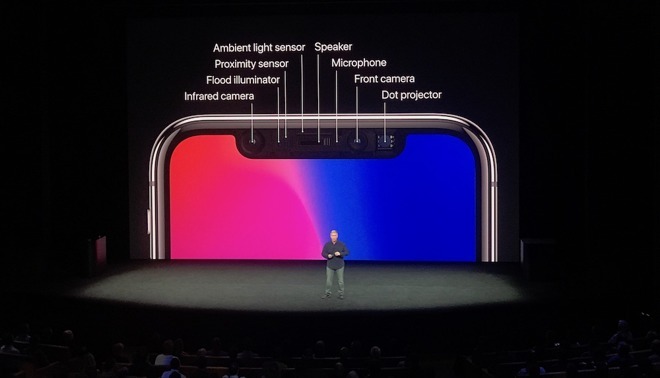 And it introduces improved rear cameras with dual lens OIS and the new front-facing TrueDepth array, a series of imaging sensors integrated into the top of the screen to support advanced new 3D facial recognition and facial feature tracking with the accuracy to serve as reliable, secure Face ID biometric authentication as well as understanding what the user is doing and supporting front-facing AR effects ranging from Portrait Lighting selfies to animated emoji. In this review, we want to focus on what's new in iPhone X and how well those dramatic new changes are implemented for real users. At the same time, while totally rethinking the familiar design of earlier iPhone models, iPhone X also incorporates the features of iPhone 7 as well as this year's parallel iPhone 8.
iPhone 8's headline features are now "a month old," but also deserve mention as being new deliverables on iPhone X as well, including the new strengthened glass and stainless steel case architecture that provides a distinctive appearance and enables the convenience of Qi "wireless" inductive charging with iP67 dust and liquid intrusion resistance; new USB-PD Fast Charging; compatibility with EVS high-quality voice calls over LTE; support for True Tone on its 3D Touch, HDR Wide Color Super Retina HD Display; the advanced A11 Bionic, which features a new 6 core CPU architecture that adaptively scales up for performance and back down to deliver energy efficiency for battery life, paired with Apple's custom GPU; larger, faster camera sensors with deeper pixels for better low light photos, paired with an incredible Slow Sync flash feature for better and more realistic scene illumination. The new Super Retina display is impressive in its appearance, performance and implementation, using a novel rounded corner design. It leverages OLED (organic light emitting diodes), a technology that was previously exclusive to rivals' phablet flagships. Those devices have primarily fixated on technical specifications, paying less attention to color accuracy and qualitative sharpness to instead deliver unrealistically oversaturated colors and extremely high resolutions that don't necessarily deliver a better experience. In fact, many of these extremely high-resolution displays are forced to play games at lower frame rates or resolutions because they overtax the processor or because developers can't optimize for every model. The best OLED screens seem to finally be getting very good overall and can deliver rich, saturated images with high-contrast and better color accuracy without the earlier issues of ghosting, blotchy sub-pixelation of early Pentile designs, poor performance in bright sunlight and an early expiration of blue pixels. However, OLED does still seem to suffer from a potentially distracting blue-green color shift at more extreme viewing angles compared to recent LCD iPhone panels. That's one of many display issues that appeared on Google's Pixel 2 XL (using a screen made by LG) and appears to affect iPhone X review units we were issued using Samsung-built displays. Other iPhone X units we handled at Apple appeared to have no color shift issues at all. 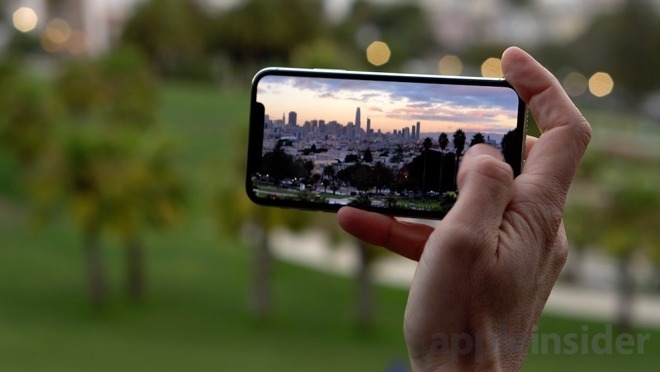 Reporting for TechCrunch after a briefing with Apple executives, Matthew Panzarino noted that the new iPhone X is not using a standard Galaxy panel or an "off the shelf" display component design Samsung offers to other firms. The nature of OLED display technology appears to cause a bluish shift when viewed at extreme angles. Apple notes that the company specifically worked to minimize the effect, and others have reported that the bluish cast that can be seen in extreme viewing angles on iPhone X is actually much improved over the typical performance of OLED. This issue doesn't affect typical use of your phone when you're looking at the device normally, up close or at a comfortable distance. In regular use, the custom panel that Apple is using Samsung to fabricate, paired with Apple's own display driver, delivers a high contrast ratio with deep blacks and vibrant colors that made our older iPhones look washed out and lifeless in comparison. It was particularly shocking to see how much better existing photos and videos look on the Super Retina display; images taken with earlier iPhones and copied over gained new life and vibrancy. Taking photos with iPhone X next to an iPhone 8, it was also evident that the new display (among other features, including new Optical Image Stabilization on its zoom lens) was far superior, in both bright outdoor sun and inside, despite being outfitted with very similar cameras and processor. Rather than having you focus on the technical details of iPhone X's OLED panel, Apple has worked to make the very boundaries of the screen blur away. There is an obvious edge to the display, but it doesn't look like a fenced-off territory of screen; it feels like a rounded windowpane offering a view of a swirling storm cloud of paint, reflecting the imagery used in Apple's marketing for it. 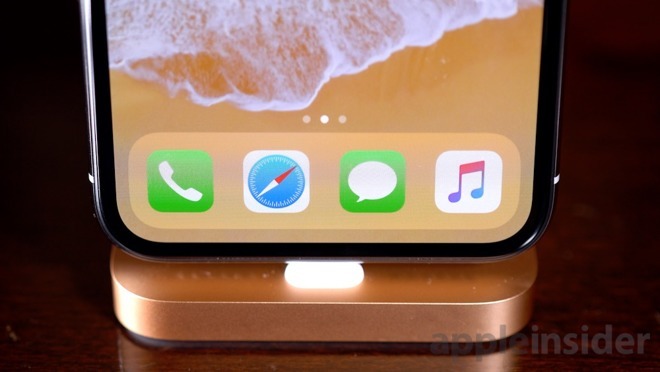 The corner radius of the display perfectly follows its rounded body contours and is reflected in interface elements such as the new iPhone X Dock. It's as if all work at Apple obeys the same kind of natural laws that organize the organic world. This isn't a new idea for the company. Andy Hertzfeld related a story from 1981, "Rounded rectangles are everywhere," where Jobs' Reality Distortion Field was used to convince engineers on the Mac that the computer needed the ability to create rounded corners, even though the first response was, "there's no way to do that. In fact it would be really hard to do, and I don't think we really need it." Now 36 years later, the rounded-rectangle body and (now) display of iPhone X continue to reflect its iOS software, where app icons and search boxes and notification panels aren't simple squared-off boxes but rather gently rounded rectangles that pay homage to the original Mac and its appreciation of good design. When Samsung copied Apple's early iPhone designs, it claimed it was inspired by "a bowl of water," the best it could do in explaining why its "crisis of design" naturally required following Apple. It was nearly true: Samsung was inspired by nature because Apple was demonstrating that technology should be inspired by the natural world. It makes technology approachable, attractive and accessible. iPhone X isn't aspiring to look like an angular techie robot on a mission to monetize everyone's content with advertising messages or a square panel of "live tile" TV boxes seeking to impose licensing taxes on the enterprise. Apple's focus on serving as the 'intersection of technology and the liberal arts' results in iPhone X feeling like less of a computer and more of a physical embodiment of capabilities and ideas — an unbounded, general purpose tool anyone can use to do whatever they need, whether that's being a better teacher, a more informed salesperson, a more socially connected teen or a less inhibited artist. That's good for Apple's bottom line, because people who pay a premium for tools recognize the value of their own time and are willing to pay others a similar amount to avoid wasting that time on the frustrations of low-end, shoddy tools. Of course, AppleInsider readers are here to read about the technical details Apple often glosses over. iPhone X's OLED screen emits light rather than creating an LCD image that is backlit by an independent layer of LEDs. This makes the display brighter and also more efficient because it selectively turns on its pixels as needed, in contrast to LED's need for constant rear illumination. This has the effect of making OLED's blacks deeper, increasing its contrast ratios. OLED's individual pixels can also be built on a thin, flexible plastic substrate, rather than the thicker, heavier, rigid glass required by LCDs. This allows iPhone X to fold over the display ends on the top and bottom, extending the image into the phone's rounded corners with uniform brightness for a dramatic effect. And because the display makes up virtually all of the front face, it results in a handheld device that appears to radiate an unbroken glow. Apple claims the "best color accuracy in the industry," and designates iPhone X as supporting HDR (high dynamic range), a qualitative expansion of high fidelity video reproduction beyond the already technically impressive P3 Wide Color supported on iPhone 7 and 8 with full color management built into the operating system, something Google is just beginning to introduce for Android. Across the last ten years, Apple has only made changes to iPhone's display size, pixel density, screen ratio or resolution three times: the Retina Display of iPhone 4 enhanced the sharpness of the UI with higher pixel density at the same 3.5 inch size; iPhone 5 added breathing room to the Home screen and apps with a taller new 4 inch Retina Display aspect ratio; iPhone 6/6 Plus introduced Retina HD with larger screen sizes (wider and taller) at new resolutions (a 4.7-inch 1 megapixel screen rendered as 2x Retina at 326dpi and a 5.5-inch, 2.07 megapixel Plus screen using a downsampled, 3x Retina rendering at 401dpi). iPhone X delivers Apple's sixth iPhone screen format: a 2.74 megapixel, 5.8-inch display with a taller new screen ratio using 3x Retina rendering and a 458dpi pixel density. Like iPhone 8, the new X supports True Tone, but Apple notes it uses a more advanced six-channel ambient light temperature sensor to adjust the display to better match the ambient color temperature of the environment, creating the effect of looking more like a paper document reflecting light rather than a screen emitting light that may appear bluer or warmer than the lighting of the room. Compared to iPhone generations 6 through 8, iPhone X packs a roughly 20 percent taller display in a similarly sized-body. Its screen is even taller than the Plus models, delivering a larger diagonal measurement, a higher pixel density and being nearly as wide. The increase in display area packed into the single-handed iPhone X makes it harder to want to keep lugging around a huge Plus. People who bought the Plus to get the best phone with the most advanced camera have a strong reason to upgrade to iPhone X, Apple's new superphone. However, iPhone X's taller screen ratio gives it more in common with the standard-sized iPhone. 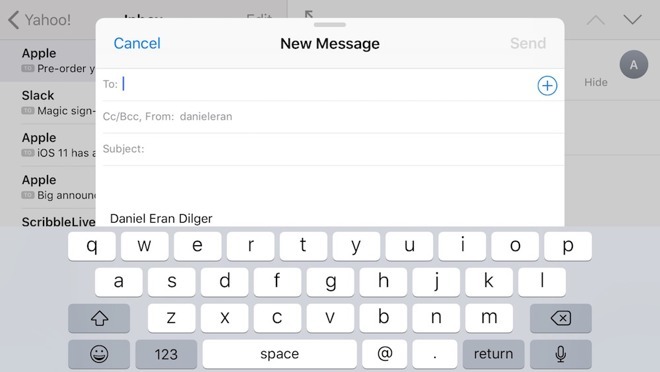 When Apple introduced iPhone 6 Plus three years ago, it gave it a Plus-sized keyboard and some other iPad-esque, wide-UI changes in its landscape mode. In iOS 11, that extended keyboard is now gone, however; the wider Plus now just uses its extra pixels for padding (below). The tall portrait-oriented display of iPhone X with a narrower width than the Plus means that held in landscape its screen is not as tall as the Plus-size iPhones, making it ever-so-slightly less useful to turn the screen sideways when using the web or in other apps. However, even Plus models have limited document-style utility in their wide orientation, and Apple hasn't made major attempts to make landscape a natural or particularly useful way to email, message or browse the web, despite the tantalizing potential of a small iPad. At the same time, for iPhone X Apple has pulled Emoji/Keyboard and Dictation keys — the only ones that pop up selection menus — off the keyboard, turning them into actual buttons off to the side (in landscape, below) or below the keyboard (in portrait), and widening other keys. This results in a landscape keyboard that's now better than the Plus, which doesn't get the same treatment. Maybe that's because Apple never really cared about the Plus, and just offered it until it could build what it really wanted to make: a high-end phone not inherently tied to a large-format screen capable of cannibalistically devouring the demand for its iPads. After years of using a Plus-sized phone, I'm looking forward to iPhone X helping to slim down the phone I carry, weaning me off my addition to the big screen of the Plus. I can't help but feel that iPhone X better achieves the core goals of iPhone 7 Plus and 8 Plus models — a large display providing an expanded canvas for apps, paired with depth imaging dual cameras — without their drawbacks in size and single-handed use. Rather than just growing incrementally larger, iPhone X inherently lends itself to one-handed use — similar to iPhone 5 — by growing taller, retaining its productive, vertical orientation while also accommodating a wide canvas for cinematic movies, video games and landscape-oriented AR experiences. The result is actually totally different: a hyper-cinematic experience that feels like you're watching a larger movie than is physically possible on the screen, akin to the joke about German cars being bigger on the inside than they are on the outside. When images and films go full screen, you don't miss the corners. It's that feel of a rounded windowpane looking into another world. I'm guessing this is because human vision is inherently wide. We prefer to see expansive vistas through a wide window rather than a narrow one. Conversely, we generally think of documents in front of us as tall, as in Letter sized or A4 paper. For "real work" we use even taller legal sized paper. By shifting to an even taller format, iPhone X delivers both an "even taller" orientation for document work and an "even wider" orientation for photos and entertainment. Still, there's an occasional bit of wonkiness in the ultra wide landscape orientation of iPhone X, which will require some attention from third-party developers to polish away. We noted a few display bugs in Apple's own software, such as photos and videos showing up misaligned after switching the orientation. 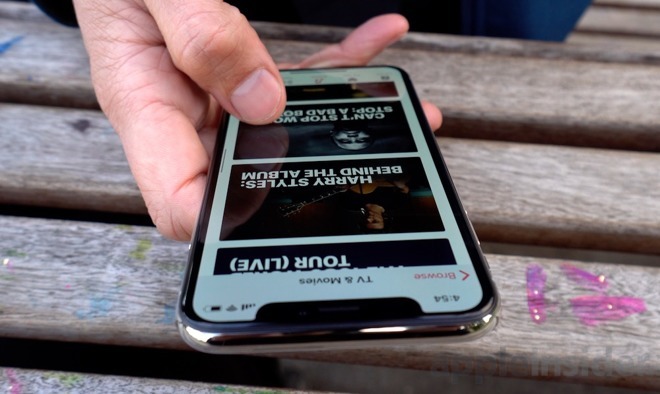 The classic double-tap iOS video playback zoom gesture (introduced for iPhones playing videos that already took up the full display) has been appropriated by Apple Music (below) and iTunes on iPhone X to take films super wide, sneaking an edge behind the permanent notch of its TrueDepth camera and into the corners. But when playing your own home movies, Photos zooms videos excessively (below). These software oddities should be easy to address, if Apple makes them a priority. Fortunately, Photos can smoothly scale video playback with a pinch to fill the screen. It's just strange the default doesn't better match the reasonable expectation of what should happen. Outside of iTunes and Apple Music, third-party apps commonly do not take advantage of iPhone X's ultra widescreen yet at all for playback. Popular video apps like HBO Now and Vimeo currently only use a fixed rectangle in the middle of the big screen in landscape, with no video zoom options at all. The focus for iPhone X appears to be on its default (tall) portrait mode. That happens to reflect the popular practice of shooting phone videos vertically, despite the fact that this creates content that looks terrible on conventional PCs and televisions. The iPhone era Millennials who grew up in a world where shooting tall video was normal do already get super-tall support for iPhone X in their favorite apps, including Facebook, Instagram, Twitter, Lyft and YouTube. 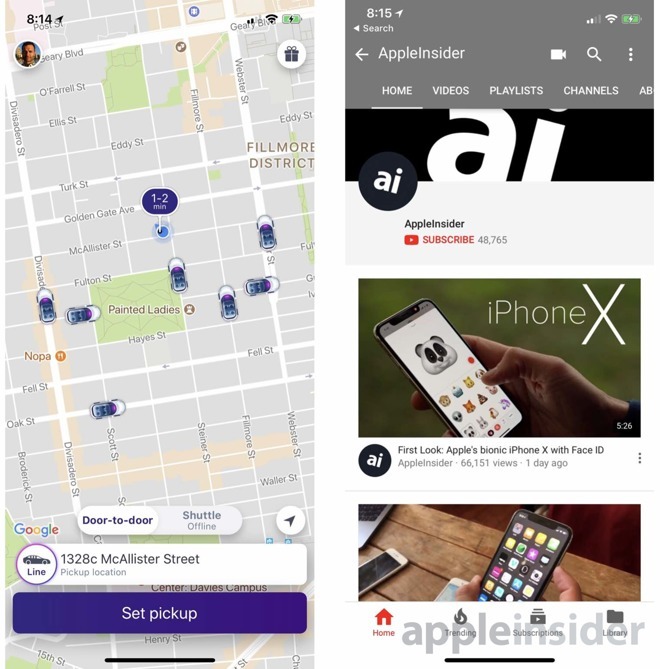 Of course, Apple makes full use of iPhone X in everything from Maps to Safari to Apple Music. Google also already takes advantage of iPhone X to play full-width landscape video (below, note that screen captures don't portray the TrueDepth sensor area). The immersive new Super Retina HD screen is intruded upon at the top by a TrueDepth sensor array (discussed in detail below). Apple felt comfortable with its design despite being initially met with clucks of fear and loathing from the blogger henhouse, in part because it's truly an insanely great enabling technology that had to go somewhere. But another thing it appears to do is tone down the super-tall orientation of the screen, which in screenshots (which don't depict the array) looks too tall. I found my brain unconsciously ignored the black strip, even when watching videos that I assumed would suffer from its intrusion. In other apps, particularly ones with a light background, it's definitely "there" but seems to draw more attention to the extra information conveyed in its ears on either side. Really, that end of the screen was otherwise going to be wasted. By putting the time, radio and battery indicators into the ears — as well as back links and anything developers can invent — Apple has only expanded the usable space remaining for the rest of the screen. But before examining TrueDepth, take a look at the bezel areas that were evicted from the phone's face entirely, taking the Home button and Touch ID with them, to make way for that massive screen. 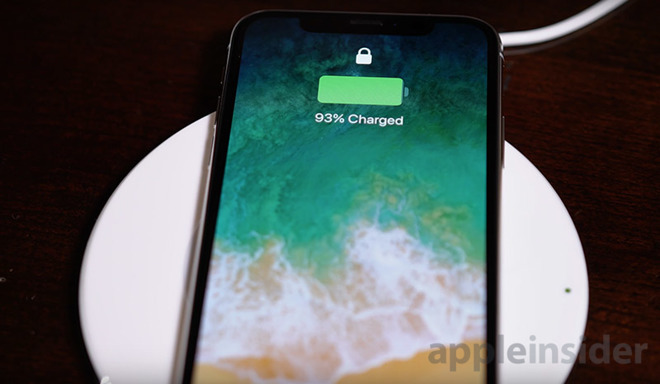 The new display technology developed for iPhone X intentionally removes the physical Home button (and its integrated Touch ID sensor) used for waking up the device, fingerprint authentication, navigating between apps, invoking Reachability, grabbing screen captures, activating Siri and accessibility features and powering the device off. That's a tall order for Face ID to replace! The Home button was initially used to wake an iPhone; you can also now wake by simply raising the phone to show the Lock Screen. 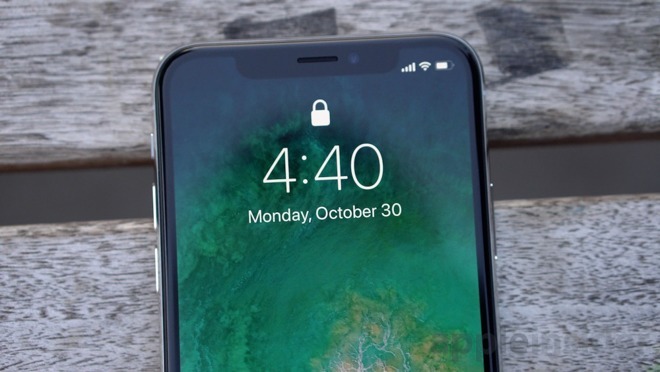 With the original "swipe to unlock" gesture, the user could jump to the Home screen, suppling an unlocking passcode if configured. This was required so frequently that most people didn't bother to configure a passcode. That security situation improved dramatically with Touch ID (way back in 2013! ), allowing users to wake and authenticate in one step. 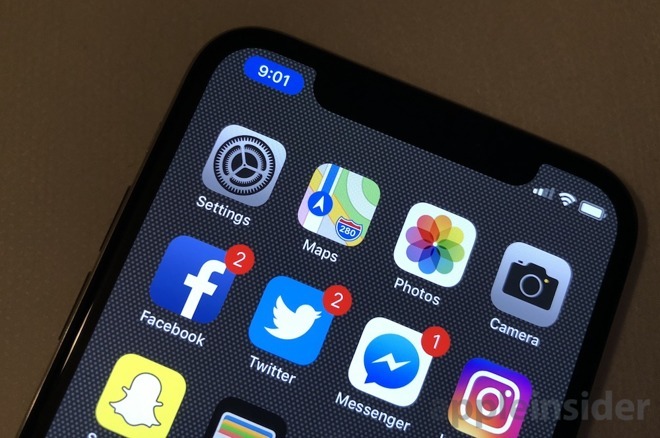 However, that effectively skipped the Lock Screen, because users commonly woke and logged in without any in-between state where one could see their pending notifications. This is one of my biggest annoyances of Touch ID. The Lock Screen is back! Another nicety of the iPhone X Lock Screen is new support for using 3D Touch to launch the Camera or Flashlight from a single press on the Lock Screen. Both are handy. You can still swipe the Camera in from the right (and Widgets from the left), but I have frequently found this gesture to be problematic when trying to grab a quick shot. Being able to tap and then 3D Touch to quickly launch the Camera is a welcome new feature. The new more powerful, configurable and 3D Touch-savvy iOS 11 Control Center has moved to a top-right-corner "swipe in" point (where the signal and battery meters now sit). It can be accessed from the Lock Screen, the Home Screen, or optionally within apps as well. It appears that the only way to see a battery percentage number is to swipe down Control Center, apparently due to the limited room in the right ear (which just shows a graphical indicator). That move makes room for new upward-bottom-swipe Unlock, Home and Multitasking gestures, located where the Home button used to be — at least in tall portrait mode. 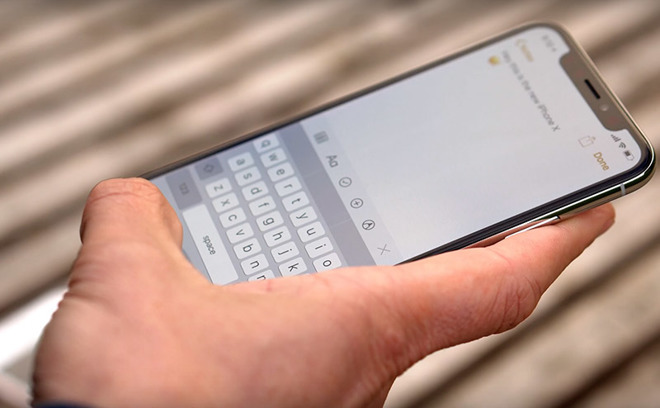 Without an orienting, physical Home button, the bottom edge swipe controls used for app switching move to stay on the bottom of the screen when you use the phone in landscape. However, unlike an iPhone Plus, the Home screen never goes into landscape orientation. A quick swipe takes you to your most recent app from the Lock Screen or Home from within an app. If you do the latter gesture slowly enough it pulls up a carousel of your background apps to switch between. This view also presents any Continuity items (such as documents you're working on from a nearby Mac or iPad) available to open up. This interface works in both portrait and landscape. However, if you swipe Home in landscape, you're taken to a portrait oriented Home. Once in the carousel, if you swipe up anywhere it takes you back Home (rather than force quitting the app). It's generally not necessary or desirable to force quit apps, but if you need to you still can by tapping and holding the app you want to kill. This will put red minus icons on each of the apps, and you can now either swipe them out of the carousel or tap their red quit icons. But wait, multitasking gets even easier! You can now swipe across the bar on the bottom of the screen to move to the next app (also shown above). You can also activate Reachability (off by default), which adds a swipe-down-off-the-lower-edge gesture as a way to pull the screen's content downward to make the phone easier to navigate with one hand. There's so much going on at the bottom of the iPhone X screen that you have to be careful with your swipes (such as when skimming through a video in Photos). Fortunately, the super smooth animations, made buttery smooth by iPhone X's unique 120Hz touch sample rate (twice that of earlier iPhones and matching the new iPad Pro models with ProMotion) that accompany all of these make it intuitively easy to understand what going on and to avoid any unintended actions. If you have difficulty with the swipe gesture, or simply like having a Home button to hit, you can activate Apple's AssistiveTouch accessibility feature, which puts a virtual Home button on the screen. You can also use this to invoke Siri, bring up Notifications or the Control Center, virtually hit volume buttons or perform other customizable tasks. Other features previously associated with the Home button are now moved to the Side Button, Apple's new name for the "power/wake button." One tap wakes the device, a double tap starts an Apple Pay purchase or in-app transaction. Apps that want you to buy something tell you to double-click the button, to invoke a Face ID approval. A press and hold on the Side Button opens Siri. A triple tap on the Side Button can be assigned to an accessibility feature, such as AssistiveTouch, Switch Control, VoiceOver or Zoom, or you can configure it to present a custom menu of those features (depicted above). You can turn on both Smart Invert Colors to make your iPhone look more like an Apple Watch, or add Color Filters to look like you have an NSA NeXTCube. Given its OLED screen, this would probably save battery life, too. Tap the Side Button along with Volume Up to capture a screenshot you can then crop and edit using Markup controls. You can also now record the screen as a video by adding the Screen Recording feature to in the new iOS 11 Control Center. Hold the Side Button with either Volume button and you can get sliders to Power Off, bring up your HealthKit Medical ID card, or make an Emergency SOS call. If the phone becomes unresponsive, you can press volume up, down and then hold the Side Button until it restarts to show the Apple logo. For most people, learning these new gestures and actions are a worthwhile tradeoff in the quest to ditch the space-hogging Home button, freeing up room for the full face display described above. 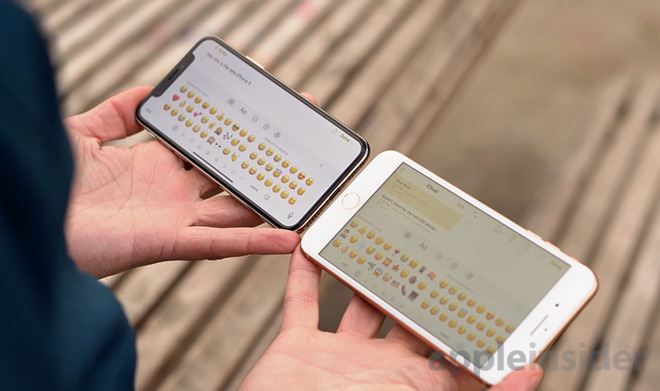 For users who are not in a hurry to jump to adopt this new expansion of the 3D multitouch bitmapped display, Apple continues to sell and support previous generations of iPhones from the original decade of iOS, defined by their Home button and Touch ID. But like aficionados of analog corded headphones and 30-Pin Dock connectors, you can bet on the past eventually going away and pace yourself accordingly. There's no rush, as Apple will likely support Touch ID iPhones for at least another 4-5 years. With Home button functionality delegated elsewhere, a proxy for Touch ID is still needed. Face ID works really well across all the lighting scenarios we tried, and didn't seem to introduce any real problems with delays or awkward positioning, but we were using the phone normally, not looking for obtuse ways we could break it. Any actions that require authentication (and use Touch ID) now make use of the new TrueDepth sensor (unique to iPhone X) to perform Face ID, which is handled by the same A11 Bionic chip and TrueDepth sensor array (discussed below) that runs iPhone X's front-facing, face tracking used by Apple's fun Anamoji feature and Portrait Lighting selfies. It's also open to third-party developers to use in their apps. Face ID enrollment is done during setup, and is even simpler than configuring Touch ID: you roll your head in a circle twice (below) and it creates a 3D model "key" that is stored in the Secure Enclave. Like fingerprint information used by Touch ID, this isn't backed up to iCloud or saved in a way that malware or rogue apps can access or spoof. With Face ID configured, once iPhone X wakes it begins looking for a face to verify as matching your enrolled profile. Also like Touch ID, the new biometric sensors can be used to authenticate unlocking your phone, Apple Pay, iTunes and App Store purchases, unlocking your Safari AutoFill data (such as passwords and credit card information) or within third-party apps such as Facebook, Twitter, banks, password managers and so on (any app that currently supports Touch ID). Unlocking iPhone X is done as soon as it detects you are looking (although this extra "attention" security can be turned off, such as if you wear sunglasses that block visibility your eyes). It occurs very rapidly as you raise the phone, making it ready to jump to the Home screen on a flick without delay. You don't have to wait for Face ID to begin swiping. On by default, "Attention" settings allow you to configure Face ID to make sure you are attentively looking at the display before recognizing your face when logging in, or separately to occasionally check to see if anyone is attentively looking at the screen before deciding to dim the display or ring the phone at full volume. Note that Touch ID is separate from Facial Tracking and Attention. Only you can authenticate, but other facial recognition features (such as Animoji) are available to anyone using the phone. If you tap the screen (rather than lift the phone) to wake the screen, you have to explicitly swipe up afterward to unlock it; you might want to do this if your phone is laying beside you at a desk and you want to check for notifications before deciding to go to the home screen. 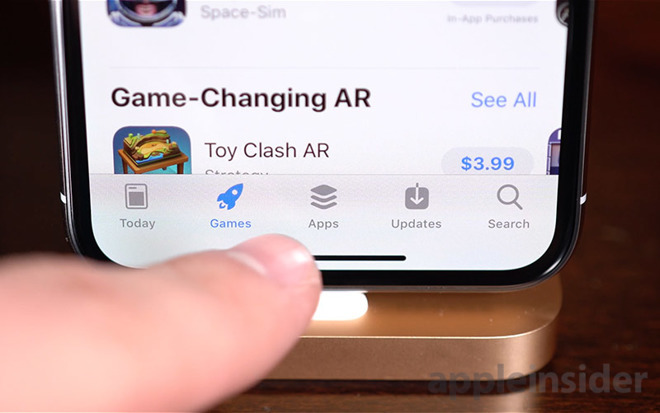 Alternatively, a tap wakes it to the point where you can invoke the Flashlight or Camera using the new 3D Touch press icons (which can be opened without unlocking, although Face ID is generally so fast that it unlocks on sight before you could open the camera, unless you try hard to avoid eye contact). If you wake the device and it sees another person's face prior to unlocking, Face ID presents a rejection, shaking the lock icon and vibrating so you're aware it failed to authenticate. You can then authenticate yourself again. If authentication fails repeatedly, Face ID stops further attempts until you enter a passcode (just like Touch ID) to prevent malicious users from unrestricted attempts to break in. Similarly, you have to enter a passcode after restarts, major software updates and after a couple days of inactivity. If Face ID isn't fully certain you're you, it prompts you to enter your passcode. This might happen if your eyes are obscured behind special glasses that block infrared light (none of the standard sunglasses I tried interfered with Face ID). It might also not verify you if you cover your nose or mouth with winter gear (just like wearing gloves with Touch ID), because the facial recognition requires the center of your face (with your eyes, nose and mouth) to be visible. Facial hair, wigs and normal clothing do not seem to affect recognition, but if you shave dramatically you might need to reenter your passcode to allow it to learn your new look. It isn't possible to "share" a face profile or independently enroll two different faces on the same device. This is possible using Touch ID, but it's not a recommended practice. It's similar to sharing a password, which in the era of Apple Pay and saved banking and social media credentials, is not only a risk to the authenticated, but also a problem for apps and services that expect biometric authentication to be a reliable way to serve a specific person. Banks also don't want you to let your friends sign your credit card receipts, not out of rudeness but due to their own liability. In practice, the only time I ever noticed that Face ID couldn't recognize me is when I held the phone horizontally. When you wake iPhone X, it always opens up in vertical portrait mode. This is the same as earlier iPhones, but Touch ID can be used to unlock sideways. On iPhone X, the Face ID unlocking process requires that you hold it tall for the moment you authenticate. Face ID is implemented using Apple's new TrueDepth sensor array that includes a standard front-facing camera and speaker, as well as an infrared dot projector that paints out a matrix of points using invisible light, a flood illuminator that beams out IR light and an IR camera that captures a depth image and the dot pattern to compare against the Face ID model it saves at enrollment. The sensor array is presented as a notch into the top of the display. 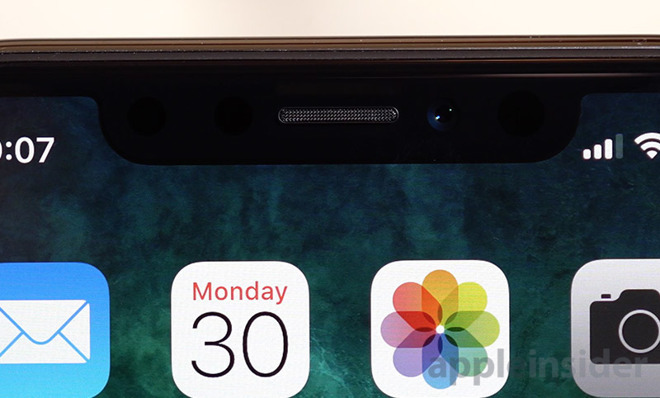 Rather than blocking it off in a black margin, Apple uses the OLED panel's ears' on either side of the sensor array to present information, such as signal strength and battery status on the right, and location status on the left. When you are navigating in Maps, rather than a huge blue GPS bar that takes up a strip across the screen you now get a small, smart blue indicator in the left ear that you can tap on to return to Maps. It cycles between the time (below) and the direction of your next turn. When you have Screen Recording on, there's a red indicator. The design of the ears on either side of the sensor also intentionally brands iPhone X as original and creative — again, from the same company that ten years ago delivered a multitouch interface so good you could go without a physical keyboard. That was similarly viewed with skepticism at the time. How could typing on glass ever be conceptually workable? Third-party apps can also make use the ears extensions of the screen or choose to block them out to present a more conventional, rectangular display area. Apple's video player begins playing in a blocked out rectangular shape, but you can double tap to take the video full screen, which extends playback "behind" the rounded corners and occluded notch on one end in landscape. I hope more developers choose to embrace iPhone X users as having purposely bought a premium device with full knowledge that those notch ears light up as part of the dot matrix display available to their apps' code. Beyond noting an attentive gaze (and using this to determine how the device sleeps or shows content), TrueDepth can also perform facial feature detection, mapping out the position of your mouth, eyes, eyebrows and the orientation of your face. Apple is initially using this to implement Animoji, an iPhone X-exclusive iMessage app that presents a set of animated emoji characters that dynamically reflect your facial expressions. 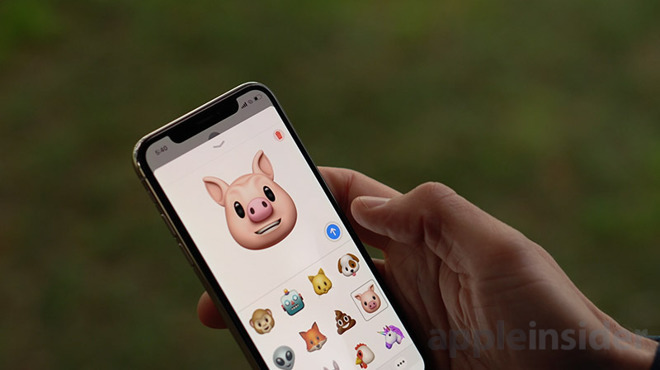 You can create personalized Animoji Stickers that can be attached to iMessage comments (make a face, then drag your mimic's image and stick it), or record animated video clips that use your voice and face to bring a selected emoji character to life. When you send one of these clips, the recipient sees it as a standard movie clip, so they should work on any iPhone or other SMS phone (just like iMessage Stickers, Digital Touch, handwritten notes, all of which send as basic images to Android users). Another Face ID feature Apple has built for iPhone X is Portrait and Portrait Lighting selfies, effectively the front-facing version of features introduced for the iPhone 8 Plus dual-lens rear cameras, making use of TrueDepth rather than calculating a depth disparity map from two photos. Using the same depth sensor hardware as Face ID, Portrait selfies build a depth map for images captured using the front-facing camera. This is interpreted to blur out the background to emphasize the subject in the style of a shallow depth of field lens on an SLR camera. Additionally, the same depth information is used to build Portrait Lighting effects that give your selfies the appearance of being studio lit by a bounce card, more dramatically illuminated in Contour Lighting, or Stage lit (in color or monochrome) with a black backdrop. These lighting effects can be used with or without the blurring effect of Portrait mode. Apple considers this feature to still be in beta. iOS 11 also opens up Face ID's facial tracking to third parties, enabling them to create their own live augmented reality filters and effects to build dynamic 3D graphics effects that are accurately mapped to your face in real-time. 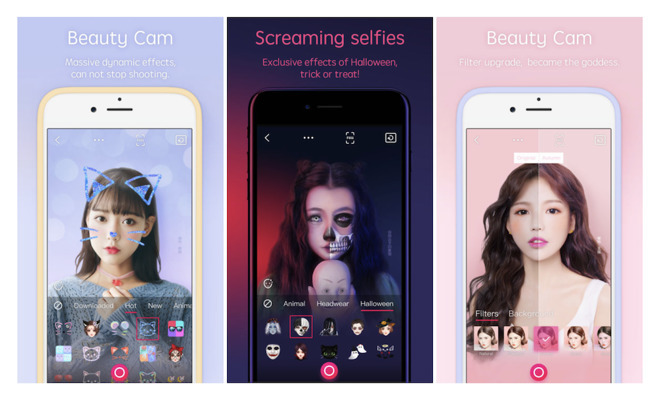 Tencent has already added iPhone X TrueDepth support to Pitu, its selfie retouching app (below). LateNightSoft's Camera+ has also added support for iOS 11's Depth API as well as iPhone X TrueDepth specifically, enabling a variety of features to selectively apply effects to the foreground or background. The app also adds support for iOS 11's new CoreML framework and the modern HEIF compression introduced on iPhone 8 and X models. Google's Pixel 2 creates a front-facing blurred background image on selfies, but it uses machine learning to guess subjects that belong in focus or not, rather than actual depth data. It doesn't offer lighting effects and does not have a depth sensor. But it does check off Portrait Mode in feature comparisons. 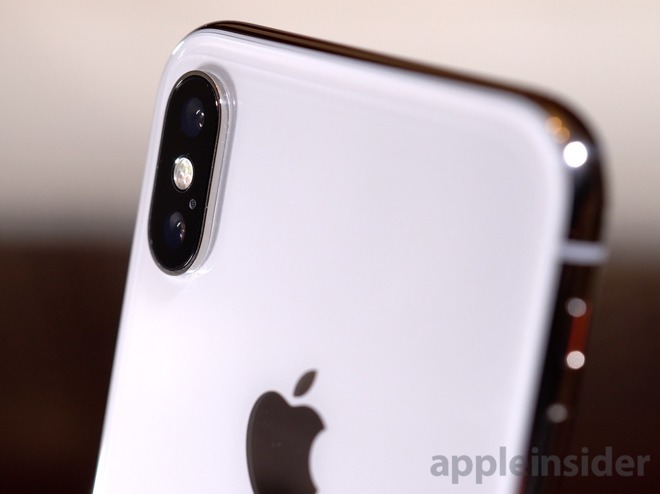 iPhone X uses dual rear camera setup similar to iPhone 8 Plus, bringing its 2x optical zoom telephoto, Portrait and Portrait Lighting features to a more compact form factor. It uses the same camera sensors, but the telephoto lens uses a f/2.4 aperture compared to the f/2.8 aperture of iPhone 8 Plus, letting in more light and therefore performing better in low light. It also implements Optical Image Stabilization on both lenses (iPhone 7 Plus and 8 Plus both have OIS only on their wide angle lens). Together, this gives iPhone X smoother zoomed video and better low light performance when zoomed, including when capturing in Portrait mode, which uses the telephoto lens. That may seem counter-intuitive, but the zoom lens is actually great for shooting close up (and closeup, slo-mo, if you want to capture little things moving quickly). The new Slow Sync flash (also on iPhone 8) is now broadly useful for improving the lighting of photos. Building upon advancements in the 4-level True Tone flash made last year, iPhone X's improved flash system automatically configures and provides flattering illumination for faces without blowing them out, allowing the background to expose properly and greatly reducing the flash flares on windows or glasses that often ruin photos when you use the flash. Even without using the greatly improved functionality of the LED flash, the faster sensor and smarter logic driving the camera system results in major improvements when taking shots in low light. Add in the new zoom stabilization and things have improved a lot in 2017 iPhones' ability to take great shots, even if the specification numbers don't seem to have. With the huge enhancement in how the flash works, the weakest remaining link in iPhone X photography is probably its use of tiny plastic lenses. Light refraction, lens flares and bright point artifacts continue to be a problem on iPhone X (visible in the OIS comparison above), and apparently won't go away until Apple decides to improve upon its lens, ideally including some sort of option for supporting external lens attachments for specialty lenses. We've written a lot about the A11 Bionic chip and its new Apple GPU, power efficient 6 core CPU, NVMe SSD controller, a new custom video encoder and its advanced Neural Net-powered Image Signal Processor. Fresh out of the box, a new iPhone X boots up and asks you to select a display language and region, then offers to skip past the typical setup screens (where you'd normally set up your WiFi network, authenticate, set up a passcode and then log into and set up iCloud services) using iOS 11's new Quick Start. From this screen, all you need to do is present your existing phone, which should be freshly backed up and updated to iOS 11. Your old phone will discover the new one and pop up a panel offering to set the new phone up, just like a new pair of AirPods. All that's left is running through the setup for Face ID, and you're ready to walk into the future. Just over a month after shaking up its iPhone offerings with new, more expensive iPhone 8 and 8 Plus models priced starting at $699 and $799 ($50 and $30 more, respectively, than last year's entry price for 7 and 7 Plus, although they include twice as much storage), Apple is launching iPhone X starting at $999 (for the 64GB model, or $1149 for 256GB). The new iPhone X options are priced $300 more than iPhone 8 or $200 more than iPhone 8 Plus—the highest prices ever for an iPhone. It's even more expensive than the cellular 12.9 inch iPad Pro with the same capacity. That price premium does not appear to be abating demand at all, demonstrating the trust Apple has built in its products. Contrast high-priced Chromebook Pixel and Microsoft Surface models that have not managed to sell in high volumes despite no shortage of marketing. Beyond Apple's own internal engineering, iPhone X draws expertise from the world's leading technology vendors, including an ultra-premium display built by Samsung in Korea, precision assembly to Apple's environmental and worker's rights standards by China's leading contract manufacturer Foxconn, state-of-the-art processor fabrication of Apple's silicon design by Taiwan's TSMC and advanced glass custom-developed for Apple by Corning in the United States. Other companies may have access to some of those same manufacturers, but unique to iPhone X is Apple's product strategy. Unlike Samsung, which uses its own ultra high resolution OLED panels to build increasing huge phablets, Apple's iPhone X adopts a Samsung display specifically to realize a smaller new phone direction, with a unique ratio and shape profile that it can support and developers will jump to take special advantage of — as Google, Facebook, Twitter and Tencent already have. iPhone X is slightly thicker and weighs in between the two 8 models. Like the 8, iPhone X feels substantial in your hand, in contrast to iPhone 7 models, which felt substantially lighter due to an aluminum shell body, rather than a stainless steel frame with a glass back. Apple's most expensive new model lineup of iPhone 8, 8 Plus and X (each offering 64GB and 256GB capacities) leaves more pricing room below to accommodate the continued sale of earlier models at reduced prices in 32 and 128GB versions. Previous 7 models are now reduced by $100, at $549 and $669, and the earlier 6s and 6s Plus are being sold at $200 less than their original debut prices: $449 and $549. This expanding range of pricing options is noteworthy because Apple has historically mostly sold its newest iPhone model each year; despite pricing discounts, demand for previous model year iPhones drops off quickly. This is completely the opposite of the rest of the industry, where Samsung and other high volume phone makers mostly ship out cheap, low-end phones at razor thin margins, despite promoting their most advanced flagships — priced like iPhones — which make up most of their profits but a small minority of their overall sales. That's not an intentional strategy, it's a predicament. looking new in depth, not just on the rear surface. At the same time, its polished stainless edge and lush, full face display will ensure everyone around you knows you have the latest iPhone Apple sells. iPhone X debuts with the fewest color options Apple has offered since iPhone 5: Silver and Space Gray. They have essentially no front bezel; both have a black TrueDepth sensor "notch" and their shiny steel frame with a black edge surrounding the full panel display. Due to their glass back (detailed below), the rear color finishes deliver a distinctive look — at least until you hide them inside a typical case, where the camera window offers only a glimpse of the newness of its finish. The front panel (detailed as feature #1, below) looks so incredible that you might never notice the glossy back anyway, despite its handsome luster. iPhone 8 offers Space Gray, Silver and Gold (the best-looking option!) with the latter two presenting a white bezel margin on the face. That white appearance isn't a thing on iPhone X, and may eventually go away like 3.5 inch screens and analog headphone jacks. Apple unashamedly calls iPhone X's bezel-free face the ultimate goal of what the company has worked to accomplish. As with the Product(RED) iPhone 7, which was sold this year between March and September, it seems likely that Apple could introduce new rear color options for its new iPhone X models later on as it catches up with initial demand, potentially with a gold or black matte edge finish when the fashion arc swings back from today's shiny "surgical steel." But no kidding, iPhone X looks very 2018. Apple depicts iPhone X as its original "true vision" for iPhone, finally achieving a full-face, bitmapped display that lets it completely get rid of the Home button (which previously moved from a mechanical button to a vibrating sensor). It introduces a front facing structure sensor that already does cool things and will unlock new capabilities as developers take full advantage of its potential. 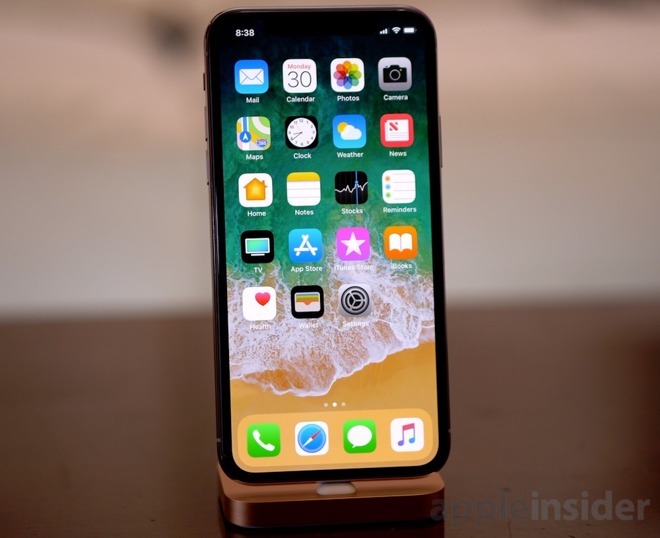 iPhone X matches iPhone 8's solid upgrades over last year's iPhone 7 (including its camera, A11 Bionic processor, Qi and Fast Charging support, improved Voice over LTE, louder speakers, fast 802.11ac WiFi and support for the new Bluetooth 5), but further adds a spectacular, expansive new display; button free navigation; new Face ID authentication and related AR effects and attention awareness features. If you already own Apple's last generation iPhone 7 and are considering an upgrade, you'll likely want to spring for iPhone X, which will feel more advanced and new than the basic 8 update. iPhone X does involve new behaviors and gets rid of Touch ID, which some people feel attached to. For users with older models who don't upgrade every year and are hesitant to pay a steep premium and/or wait for iPhone X to become available, iPhone 8 or the discounted iPhone 7 may offer enough new advancements in speed, camera features and water resistance to delay leaping to Apple's most advanced — and most expensive — iPhone yet. Apple's iPhone X went up for preorder now last Friday, but launch day units sold out within minutes. For those looking to snag a copy on Friday, Apple is offering limited supply at brick-and-mortar retail stores, with some locations opening early. 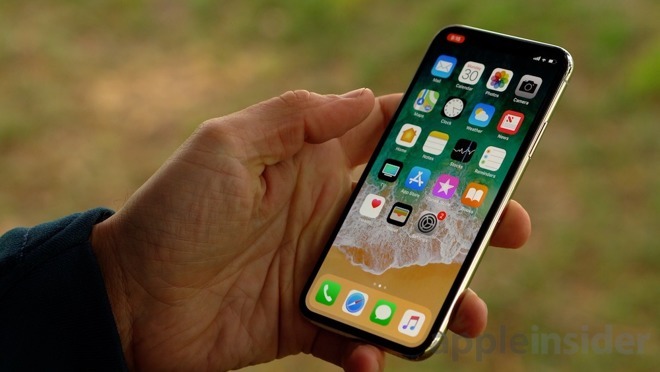 Alternatively, Apple and third-party resellers, including carriers, such as Verizon and AT&T Wireless, are accepting online orders, though delivery estimates for all models are pushed out 5 to 6 weeks.